Australia is pretty bloody serious about their Anti-Hoon Laws. You may get your car impounded or, in the worst case scenario, may be ordered to have your car scrapped… Formula 1 driver, Lewis Hamilton was arrested for doing burnouts on his C63 AMG during Australian GP a few years ago, too. But Anti-Hoon Laws only apply to public roads… thought one man named Mick Brasher. 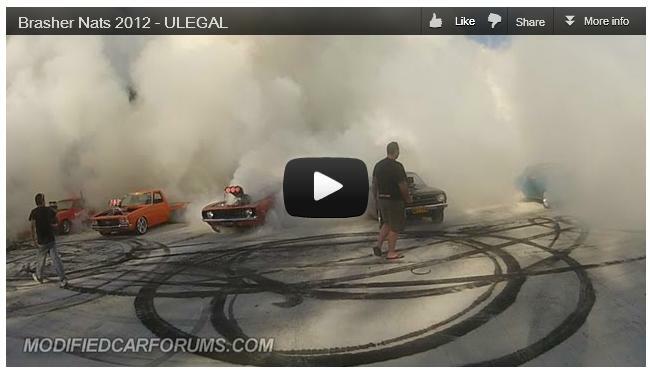 So, he hosted huge burnout session, that will surely make you smile, at his backyard. Oh, by the way, Australian Police is dead serious about Anti-Hoon Law… so serious, they even use helicopters to catch offenders.